Enhanced Abilities: Brutaal has vast super human strength, agility, durability, super-speed and endurance. Invulnerability: Brutaal is practically invulnerable to any form of physical or energy attack. Super-Breath: Brutaal can freeze a target with his breath or create strong gusts of wind. Flight: Brutaal is able to fly. Super-Hearing: Brutaal has the ability to hear any sound at any volume or pitch. Super-Vision: Brutaal has X-ray, Electro-magnetic, Microscopic, Infrared and Telescopic visions. Heat Vision: Brutaal has the ability to fire beams of intense heat at a target by looking. When Kal-L's Father, a renowned scientist named Jor-L, discovered that their home world of Krypton was about to explode he desperately attempted to convince his fellow Kryptonians of the danger their people was facing but they refused to believe him. Nevertheless Jor-L built a starship for his infant son Kal-L and though it pained both Jor-L and his wife Lora to send their only child away they both knew it was for the best. Shortly after his rocket was launched into space, Krypton exploded killing Jor-L and Lora and sent a "meteor shower" of irradiated chunks of the Krypton flying across the Universe. Most of which travelled alongside Kal-L's ship before it inevitably came to crash in a cornfield near Smallville, Kansas where the infant Kal-L, who had miraculously survived both the destruction of Krypton, the hazards of outer space and exposure to the large chunks of irradiated "Kryptonite" which joined his ship on it's journey to Earth, was found by John and Mary Kent who had been passing by when Kal-L's ship crashed to Earth. Taking Kal-L in as their own, he was given the name Clark Kent and was raised on the Kent Farm for years without even knowing of his true origins until one day he began to slowly discover that he had extraordinary superhuman abilities that defied all the laws of physics but still remained unaware of his Kryptonian origins. In time John and Mary passed away and Clark decided to use his newly-found powers for the good of the world. He moved to the city of Metropolis in order to properly start his career as a superhero as well as becoming a reporter for Metropolis' local newspaper: The Daily Star. 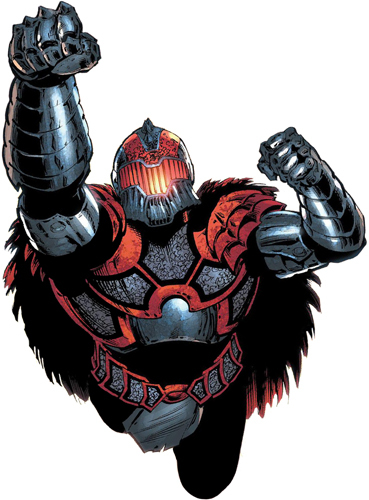 When Darkseid sent the Apokoliptian Steppenwolf to erect Boom Towers across the world in order to invade it with his Parademons he established one in Metropolis. Superman seemingly died repelling Steppenwolf’s attack. Superman somehow survived however and was captured by Darkseid's forces and was brainwashed at some point during the five years after the war. Kal-El took the alias Brutaal and began working with the Hunger Dogs under Steppenwolf.